Can You Spot All the Safety Hazards in this Video? 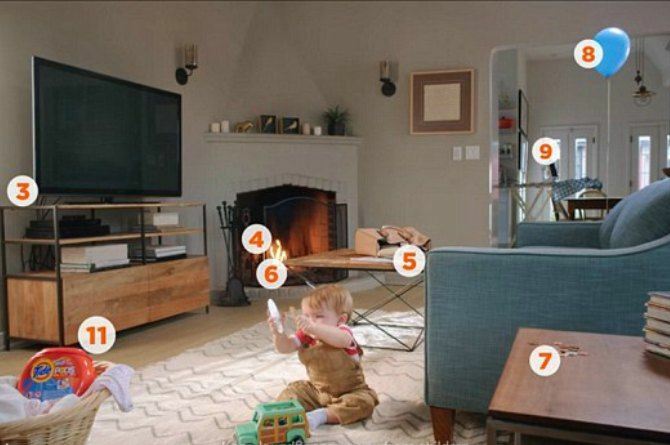 In a public service announcement created by TIDE, it offers an effective way to test parents’ ability to determine the safety threats around the house that could harm their child. The video shows a toddler playing on the in middle of the living room floor. It then asks the viewer to spot as much safety hazards as they could. In total, there are 11 items, including uncovered power outlets, blind cord, sharp edges, handbag contents, and laundry pacs. The most alarming aspect of the video is how common these items are. According to Christine Erskine from Kidsafe, her number one tip for parents looking to keep their children safe is to manage your environment. “Make sure it's good for the age and stage of your child, so that when you turn your head, which you will do once, even if it's just for a few seconds, they're as safe as possible. Babies who can walk attract even more danger, Christine added. In a Daily Mail article, they offered three simple ways on how you can baby-proof your house. Sanskrit slokas for the wise kid! Sania Mirza's fitting reply on why women don't need to be a mother to "settle down"